London’s anti-terror chief, Nick Aldworth, has warned that Oslo’s main “parade boulevard,” Karl Johans gate, is vulnerable to attacks carried out by vehicular terrorists driving cars and trucks. Top Oslo politicians claim more security measures to prevent such attacks are right around the corner. VG reported that he strolled himself up the boulevard that’s used for major parades with the recent attack in Barcelona fresh in his memory. Another similar attack occurred this week in New York, following those in other cities including Stockholm, Berlin and Nice. Aldworth said that an attack outside Westminster in London shows that barriers set up along streets and sidewalks can save lives. Most of Karl Johans gate is closed to vehicular traffic and used as a pedestrian street, except for the area between the Royal Palace and the Parliament. It’s not difficult, however, for vehicles to enter the pedestrian areas despite some large and heavy planter boxes consciously placed alongside the Parliament building (Stortinget). Steps were taken to cordon off access from side streets leading into Karl Johans gate during this year’s large parade on Norway’s Constitution Day on the 17th of May. The grounds of the Royal Palace were also blocked by strategically placed trucks and vans that hindered access, also during a recent outdoor performance by the Oslo Philharmonic Orchestra. Oslo, however, has a long history of political reluctance to set up visible security barriers to public access, favouring an image of an “open and friendly” city. Both state and city politicians were harshly criticized for failing to restrict access to the one-way street that ran behind state government buildings in downtown Oslo, allowing it to be freely used by the right-wing, anti-immigration Norwegian terrorist who parked a van laden with a powerful bomb just outside the entrance to the Office of the Prime Minister. It exploded on July 22, 2011, destroying the government complex and killing eight people. The street running right behind the Parliament building, Akersgata, wasn’t blocked to vehicular traffic until the president of the Parliament had to specifically ask the city government to act, two years after the July 22 attacks. City officials had delayed closure for years before that, wanting to keep the area open. Johansen claimed measures nonetheless loom to help enhance security. He told Norwegian Broadcastig (NRK) that a “working group” has been set up “to study security goals,” and he said the city has an ongoing dialogue with police regarding specific security measures. Justice Minister Per-Willy Amundsen of the conservative Progress Party didn’t want to comment on measures for which the Labour-run City of Oslo is responsible. Amundsen is in charge of Norway’s police force, however, and he told VG that he contacted the state police directorate in August. He wrote that the attack in Barcelona stressed the need to “carry out various security measures to prevent terrorist attacks against large gatherings of people through use of a vehicle,” and he asked that local police districts be “instructed” to “enter into dialogue with local governments to improve security. 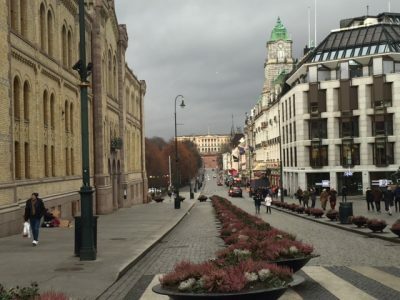 Johansen, who has supported controversial programs to discourage the use of cars and trucks in central Oslo, said the city is now “working to improve security,” also on Karl Johans gate.